Amazon UK continues its ad campaign promoting Amazon Prime and its unlimited One Day Delivery on millions of items with a new touching advert. 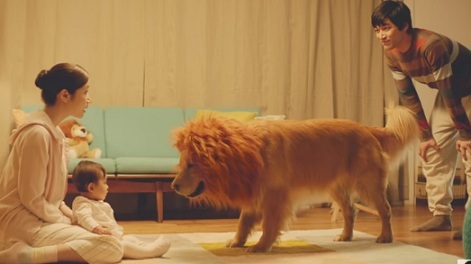 Created with the idea that “Everybody wants to feel like they belong, even the family dog”, the 60-second spot, produced by Amazon’s Japanese division and titled “Lion”, features a golden retriever trying to befriend the family’s newest member, a baby girl. Unfortunately, the latter gets scared and starts crying, so he must keep the distance, until her father’s idea, of using a stuffed lion doll, is put into practice. The father has another idea and goes to Amazon Prime to make his order: a lion mane that his golden retriever is wearing around the head when he approaches the baby girl again. This time, she reaches out to the dog, who’s smart and closes his mouth when he’s face to face with her. The song playing in the background is “You and Me” by American singer-songwriter and musician Arielle Paul. The ad was launched in 2016, in Japan, and has been going viral just one day after National Puppy Day.